1. Choose the right size for your garden. When you are first starting out, it is usually best to err on the side of caution and make your garden smaller than you think you actually need. One of the biggest mistakes that beginners make is planning a garden that is much larger than they can care for. Gardening takes a lot of time. By keeping your garden small during your first year, you can get a feel for how long it will take you to manage it so that you can decide if you want to go bigger next year. 2. Choose a location for your garden. Ideally, you should pick a spot in your yard that gets at least six hours of sunlight each day. Avoid areas where the sun beats down mercilessly all day or where it is always shaded. Although it is possible to grow plants in full sun or full shade, you will have a lot more options if you can find an area that gets a good balance of sun and shade. 3. Prepare the area. Remove any sod from the area and turn the soil, loosening it up so that the roots of the plants have an easier time getting established. 4. Choose your plants. One of the easiest ways to get started with flower gardening is by using a wildflower seed mix. Wildflowers tend to be quite hardy and don’t require much care. If you prefer, however, you can choose individual plants. Whichever plants you choose, make sure that you read the care tag on the plant to see if it will survive in the conditions in your yard. Avoid plants that are notoriously hard to grow such as roses, opting instead for easier plants such as cosmos, geraniums, marigolds, pansies, and phlox. 5. Put the plants in the ground. Once you have selected your plants, the next step is to actually plant them. If you are planting seeds, follow the instructions on the seed packet. If you purchased bedding plants, on the other hand, dig a hole that is slightly larger than the roots of the plant. Place the plant in the hole, pressing the soil in firmly around the base to anchor it in place. Once all of your plants are in the ground, thoroughly water them. Continue caring for the plants throughout the year, following the instructions on the care tag that came with the plant when you purchased it from the nursery. 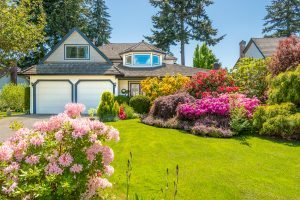 Even if you are an absolute beginner, you can grow a beautiful flower garden in your yard by using these tips. The key is to choose the right location for your garden and to select plants that will thrive in your unique growing conditions.